Surfing the Internet can feel like you’re running in circles, constantly checking your favorite sites for updates. The RockMelt team believes that content should be delivered, not hunted, so its new browser app for iPad is built around a stream instead of a blank window. RockMelt for iPad lets you connect your Facebook and Twitter accounts, pull in feeds from sites you Like, follow friends, and get hooked up with recommended publishers. It combines these all into an omni-feed and vertical specific streams you can peruse without ever pulling up the keyboard. And get this: it has no address bar. The iPad app comes from the makers of the RockMelt social browser, a desktop app built on Google Chromium that is designed to innovate where Internet Explorer, Firefox, and even Chrome stagnate. It’s seen modest pickup and strong engagement: 4 million registrations up from 1.7 million in January and active users spending 7 hours and 15 minutes a day in RockMelt. But it just doesn’t have the marketing budget or cross-promotion power of its bigger competitors. What it does have is a lot of insight on how people browse the web, bought with nearly $40 million in funding from an all-star lineup of investors including Andreessen Horowitz, Khosla Ventures, Accel, SV Angel, and First Round Capital. It found users were clicking their RockMelt bookmarks 27 times a day. People didn’t want to search or enter URLs. They wanted to click. 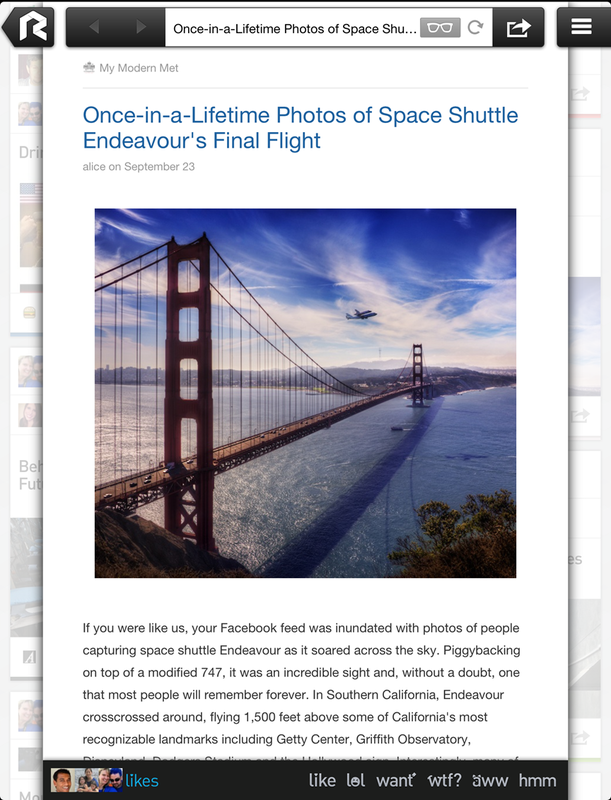 RockMelt for iPad applies that knowledge to redefine mobile browsing. Once RockMelt has imported your social feeds and interests, you can auto-subscribe to a personalized set of outlets you’ll probably enjoy or choose from a huge list of the world’s top blogs and sites. From then on you can sit back and watch your favorite sources push content to you. It makes for a relaxing yet stimulating experience that fits great on the tablet. Feel like having a laugh or learning something new? Pull up the vertical-specific categories like LMAO or Tech News to see dedicated feeds of that kind of content. If you see an article or update you’re interested in, just tap it and it will either load super quick in a reader-view pop-up or in a full-sized tab. RockMelt has struck deals with tons of publishers to give them fast loading versions of their content with fewer ads in exchange for better social discovery and more traffic. The company is totally focused on growth right now, but I’d imagine publishers might pay to get their content injected into the feeds of people who don’t follow them, similar to Facebook’s Sponsored Stories ad format. RockMelt’s search feature can scan all of your feeds for keywords, or direct you to a pertinent website. If all else fails, it shows a link to a page of Google search results for the term. 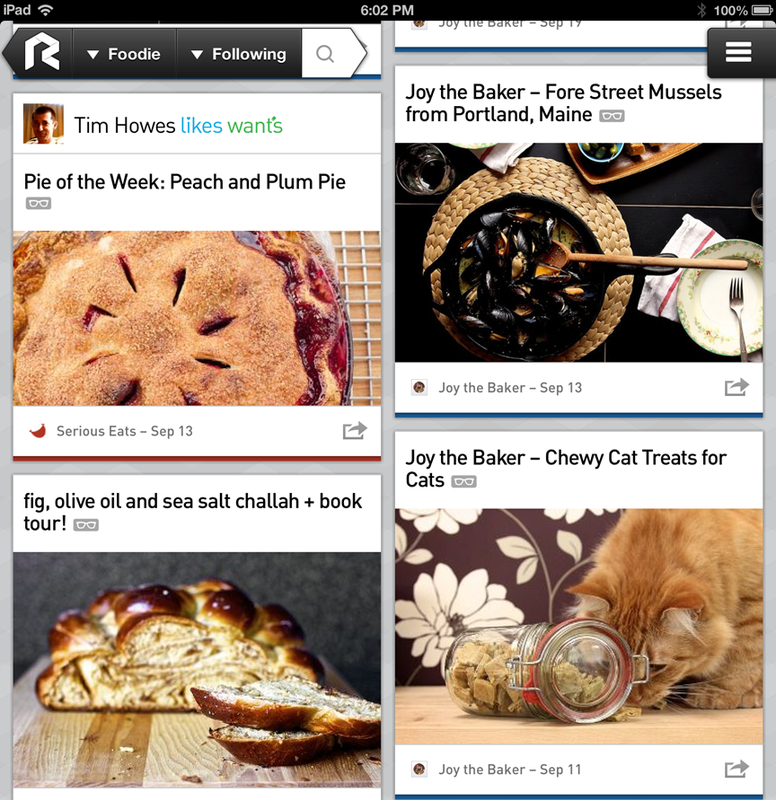 You can share content out to your social networks, but RockMelt also has an innovative in-app sharing system. It uses what are called “emoticode” one-click feedback buttons so you can like, lol, want, WTF, aww, or hmm content that will then appear in the RockMelt feeds of people follow you. There is still the philosophical question of whether a tool that helps us seek out and consume more content will actually make us happier. Quick hits seem to deepen our addiction to information rather than satisfy us. But Vishria was quick to retort that RockMelt doesn’t necessarily aid procrastination. By making consumption more efficient he thinks we might get our fix and get back to work. Gaining traction without money for flashy ads will be tough, and RockMelt may need to build in some better viral hooks than just asking users to invite friends at the start. But the app is very solid, so retention should be too if RockMelt can get people to sign up. If you like the idea of a better way to browse but don’t have an iPad or don’t carry one around all the time, you’re in luck. Vishria has confirmed his team is working on turning RockMelt for iPad into a website that brings together the best of the web just for you.